Keep This Quiet! is a fascinating memoir in this regard, one that is multi-faceted in terms of Harrell’s own journey of self-discovery, both in a personal and artistic sense and the manner in which this is mirrored by the events of the period, with the tumultuous Sixties marking a nation tragically losing its innocence courtesy of the assassins bullet and the toil of war. It is also, of course, a time of exuberant creativity and this is evident throughout, with Harrell also detailing her relationship with “poète maudit” Jan Mensaert andGreenwich Village “poet genius” Milton Klonsky. Working at Random House placed Harrell at the centre of a literary world and this is reflected by the many different characters that make an appearance – from Hunter’s oldest friends William Kennedy and David Pierce to non other than Oscar Zeta Acosta, of whom Harrell includes rare letters that he sent to her concerning getting published at Random House. The above quote comes from a letter in The Proud Highway and Harrell is absolutely correct in singling it out for its importance. As Harrell states – “Like Faulkner, Hunter wanted to leave his life in stone tablets, mark time with a sign KILROY WAS HERE.” To understand this in relation to Hunter and how it shaped his creative development is absolutely essential. In closing, this book is a joy to read, particularly for anyone that has that urge to express themselves through the creative arts in all their forms. 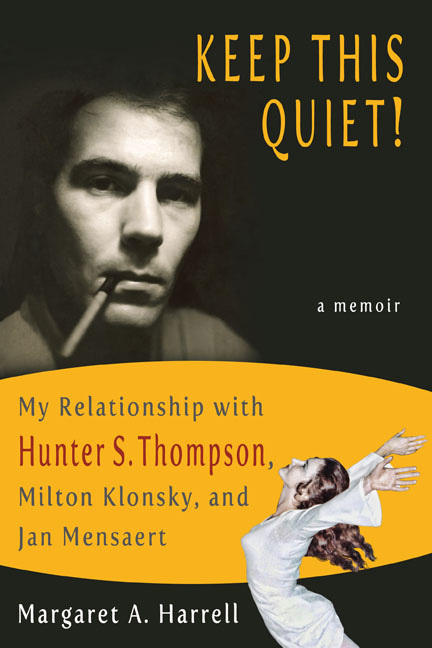 In terms of its importance to the Hunter S. Thompson world I would have to say that there are not many other books out there that have the same intimate understanding of the man behind the myth. Keep This Quiet is not just a reflection on the past but also a rediscovery of that period, with a new understanding of the events and the people that populated that particular corner of the era of rapid change and growth, one of both personal discovery and cultural revolution, whose effects to this day are still rippling across the consciousness of the American psyche.